JIM LEHRER: I think we could keep this going here for several more minutes or longer, and there's not going to be an agreement, so let's go to something we agree on, David, the governor of Illinois. Express your shock. DAVID BROOKS: I think he's a great guy. I'm just trying to stoke disagreement. No, you know, it's like first is tragedy, then there's farce. I covered Chicago politics back in the day of the machine, and Fast Eddie Vrdolyak, and that was tragedy. That was really ruining a city. This guy, he's like he's re-enacting a scene from the "Entourage" or from "The Godfather." He's like re-enacting. It's pathetic, basically, the way he's behaving, $500,000 for a Senate seat, when he knows people are likely to tape him? It's just -- it's just amazing. You know, you can -- well, anyway. 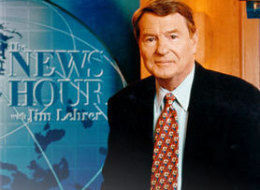 JIM LEHRER: Well, what about the point, though, that a lot of people are making, Mark, that the only thing Blagojevich did that's different than the normal course of human events is that he was gross about it and he said it -- he didn't say it publicly, but he said it -- there's trading that goes on all the time over Senate -- the appointment of senator -- of empty Senate seats. JIM LEHRER: What's the big deal here? MARK SHIELDS: There have been some authentic giants appointed to the Senate in the 177 senators who've been appointed since we first began electing senators popularly in 1913. George Mitchell, a great senator. JIM LEHRER: No, but I mean there's always been trade-offs. That's what I'm saying. MARK SHIELDS: No, no, I mean, but there -- I mean, the product is the test. MARK SHIELDS: And whether we come up with an Arthur Vandenberg, who was responsible for the Marshall Plan, Sam Ervin of the Ervin Committee, I mean, they were all appointed senators. So they aren't all stumblebums who were just some sort of political reward. Jim, when governors sit down to appoint a senator, they don't say, "You know, which one of these guys is going to be Henry Clay? You know, should we get Webster or Clay, maybe a Calhoun?" They want somebody who's not going to be under indictment or detox in six months, but at the same time there are political considerations. This guy took it -- governor of Illinois -- took it to a level or a depth so beyond in terms of craven, avariceness, greed, amorality. I mean, it truly was. I'll tell you how dumb this guy is. Since the Congress of the United States began 219 years ago, there have been 11,991 members of the House of Representatives, of who he was one. He served three terms. Every one has one thing in common: They were elected. That's the only way you can get to the United States House of Representatives. In his discussions on tape, the FBI has, he's talking about whether they can get some money for an interim appointment to Congressman Rahm Emanuel's seat, who's become the chief of staff to President-elect Obama, I mean, not even knowing that nobody is appointed to the House of Representatives. I mean, their cravenness and their stupidity merged. JIM LEHRER: But you don't -- but that's what I'm actually essentially asking here, is that -- is that he just went over the line of something that is the way you do business. Wow. He just went over the line. Can you imagine Lehrer taking this position if Blago and Obama were Republicans? Think Blago's actions would be just standard operational procedure a tad over the line? Yes, those were both rhetorical questions.